February always seems to go by so fast. Maybe it’s the 28 day thing or maybe it’s because of being sandwiched between the exciting start of the new year and the anticipated beginning of spring and action of the warmer months but February almost passes by without notice. 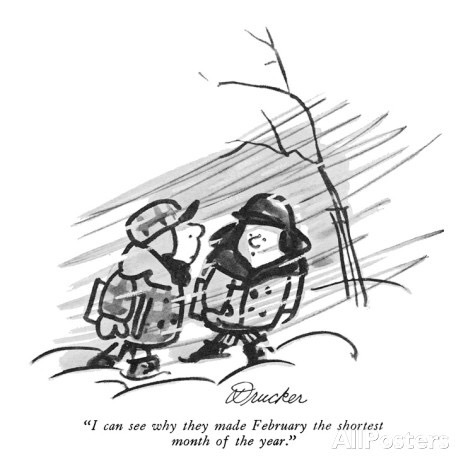 Whatever the reason, I like to appreciate February because I think it gets shortchanged a bit. Yes, it gets Valentine’s Day and Presidents’ Day mid month and Groundhog Day and the Super Bowl in the beginning of the month but that’s about it. It always has the feel of the month that’s simply taking up space before you get to March when things really get cooking and the year really starts to get rolling. So all that being said, I’m going to make every day in February count, even if just a little bit. This month I will post at least a little something each day, often just a little comment, thought or acknowledgement simply to let February know that it may go by in the blink of an eye but it will still be appreciated.